Construction began on March 20, 1936, and it was finished on May 23 of the same year. It was designed by architect Alberto Prebisch (one of the main architects of the Argentine modernism who also designed the Teatro Gran Rex, in Corrientes and Suipacha) at the request of the mayor Mariano de Vedia y Mitre (appointed by president Agustín Pedro Justo). For its construction, which cost 200,000 pesos moneda nacional, 680 cubic meters (24,000 cu ft) of concrete and 1,360 square meters (14,600 sq ft) of Olaen white stone from Córdoba were used. The obelisk was built by the German company G.E.O.P.E. - Siemens Bauunion - Grün & Bilfinger, which completed its work in a record time of 31 days, with 157 workers. The rapid hardening Incor cement was used and was built in sections of 2 meters (6 ft 7 in) to facilitate the dumping of concrete. Its height is 67.5 metres (221 ft), and 63 metres (207 ft) of these are up to the initiation of the apex, which is 3.5 by 3.5 meters (11 by 11 ft). The tip is blunt, measuring 40 centimeters (16 in) and ends in a lightning rod that can not be seen because of the height, whose cables run through the interior of the obelisk. It has only one entrance (in its west side) and on its top there are four windows, that can only be reached by a straight staircase of 206 steps with 7 breaks every 6–8 meters (20–26 ft). On February 20, 1938, Roberto María Ortiz succeeded Justo and appointed Arturo Goyenche as the new mayor of the city. In June 1939 the City Council sanctioned the demolition of the Obelisco, citing economic, aesthetic and public safety reasons. However, the ordinance was vetoed by the municipal executive power, characterizing it as an act lacking of value and juridical content, because it alters the state of things emanated by the executive power, and that it was a monument under the jurisdiction and custody of the Nation whose heritage belongs to it. Where the Obelisco stands, a church dedicated to St. Nicholas of Bari was previously demolished. In that church the Argentine flag was officially hoisted for the first time in Buenos Aires, 1812. That fact is noted in one of the inscriptions on the north side of the monument. As a result of some detachments of stone cladding, which occurred on the night of June 20–21, 1938, the day after a public event with the presence of president Ortiz took place there, it was decided to remove such cladding in 1943 and was replaced by another one made of polished cement, making cracks to simulate the joints of the stones. When the slabs were removed, a legend that said "Its architect was Alberto Prebisch" was also removed. In 1973, it was decorated as a Christmas tree. In 1975, during the Peronist government of Isabel Martínez de Perón, a ring-shaped rotating sign was hung around the obelisk, with the motto El silencio es salud (Silence is health). Although it was allegedly geared against motorists creating excessive noise, it was widely interpreted as a statement calling Argentines to refrain from expressing their political views. Throughout its history, the monument has suffered vandalism, especially politically oriented graffiti. In the 1980s, an activist group broke in and spilled paint from the top windows, causing the city government to erect a fence around its base in 1987. This move stirred controversy, but eventually proved effective in reducing the number of defacing incidents. On 1 November 2005 it was announced that a comprehensive restoration, financed by the Argentine painting and restoration industry association (Ceprara), was finished. The monument was painted with 90-micrometre acrylic paint to a "Paris stone" hue, deemed more pleasant than the previously used white. In the renovation, Bungee jumping was made available to tourists. Although you are not allowed "inside" the monument, the government has allowed the service stairwell you be used to access the bungee jump as long as 10% of the proceeds go to help at risk children and teens. On December 1, 2005, the obelisk was covered by a giant pink condom to commemorate the World AIDS Day. To commemorate the 30th anniversary of the La Noche de los Lápices, the monument was converted into a giant pencil. 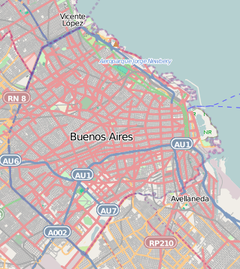 Lines B, C, and D of the Buenos Aires Metro have stations near the monument, and are connected by a number of underground passages with commercial galleries. The Obelisco hosted the opening ceremony of the 2018 Summer Youth Olympics. II of February of MDXXXVI. Poem by Baldomero Fernández Moreno inscribed on the south side. y a los cielos azules asestada? giren a tus pies, devanadera. ^ Buenos Aires' obelisk wears pink condom for World AIDS Day., December 1, 2005. 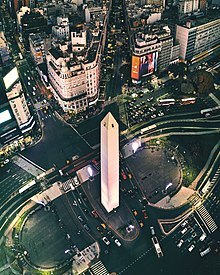 Wikimedia Commons has media related to Obelisk of Buenos Aires.